There are 15 counties in the U.S. state of Arizona. Four counties (Mohave, Pima, Yavapai and Yuma) were created in 1864 following the organization of the Arizona Territory in 1862. The now defunct Pah-Ute County was split from Mohave County in 1865, but merged back in 1871. All but La Paz County were created by the time Arizona was granted statehood in 1912. Eight of Arizona's fifteen counties are named after various Native American groups that are resident in parts of what is now Arizona, with another (Cochise County) being named after a native leader. Four other counties, Gila County, Santa Cruz County, Pinal County, and Graham County, are named for physical features of Arizona's landscape: the Gila River, the Santa Cruz River, Pinal Peak, and Mount Graham, respectively. Another county, La Paz County, is named after a former settlement, while the final county, Greenlee County, is named after one of the state's early pioneers. Under Arizona laws, a county shall not be formed or divided by county initiative unless each proposed county would have all of the following characteristics: (1) at least three-fourths of one percent of the total state assessed valuation and at least the statewide per capita assessed valuation; (2) a population of at least three-fourths of one percent of the total state population according to the most recent United States decennial census; (3) at least one hundred square miles of privately owned land; (4) common boundaries with either (a) at least three other existing or proposed counties; or (b) at least two other existing or proposed counties and the state boundary. A county formation commission is required to be formed to evaluate the feasibility of the proposed county. A proposal to divide a county must be approved by a majority of the votes cast in each proposed new county. Under the Arizona Constitution, counties are politically and legally creatures of the state, and do not have charters of their own. Counties are governed by boards of supervisors which act in the capacity of executive authority for the county within the statutes and powers prescribed by Arizona state law. The state legislature devotes considerable time to local matters, with limited discretion granted to the Board of Supervisors on minor ordinance and revenue collection issues. Arizona's postal abbreviation is AZ and its FIPS code is 04. Butte County: In 1897, James C. Goodwin, with the support of Charles T. Hayden and others, introduced a bill at the Territorial Legislature to split Maricopa County into two, with Tempe being the county seat. There have also been proposals, introduced in 1900 and 1913, to divide Maricopa County, with Mesa as the new county's seat. 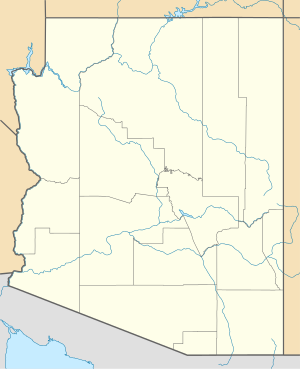 Sierra Bonita County: proposed at the 13th Arizona Territorial Legislature in 1885, with Willcox proposed as the county seat. The proposal died by one vote. Bannon County, a fictional county in Arizona, was the site of the UFO crash in the film Hangar 18. ^ "Find A County". uscounties.org. Archived from the original on September 5, 2012. Retrieved April 7, 2012. ^ a b Kane, Joseph & Aiken, Charles (2004). The American Counties: Origins of County Names, Dates of Creation, and Population Data, 1950–2000. Scarecrow Press. ISBN 0-8108-5036-2. ^ "EPA County FIPS Code Listing". EPA. Archived from the original on September 28, 2004. Retrieved April 9, 2007. ^ a b c d National Association of Counties. "NACo – Find a county". Archived from the original on April 10, 2005. Retrieved April 30, 2008. ^ "History of Greenlee County: Mason Greenlee". Greenlee County Government. Archived from the original on February 19, 2014. Retrieved July 20, 2007. ^ "The Name Mojave". Mojave Desert Heritage and Cultural Association. Archived from the original on February 13, 2015. Retrieved March 1, 2015. ^ Rowe, Jeremy (2011). Early Maricopa County: 1871–1920. Arcadia Publishing. p. 39. ISBN 978-0-7385-7416-5. Retrieved November 15, 2017. ^ a b Mark, Jay (January 12, 2017). "Tempe history: Tempe — Seat of Butte County". The Arizona Republic. Retrieved November 15, 2017. ^ McClintock, James H. (1916). Arizona, Prehistoric, Aboriginal, Pioneer, Modern: The Nation's Youngest Commonwealth Within a Land of Ancient Culture, Volume 2. Arizona: S. J. Clarke publishing Company. p. 334. Retrieved February 17, 2017.